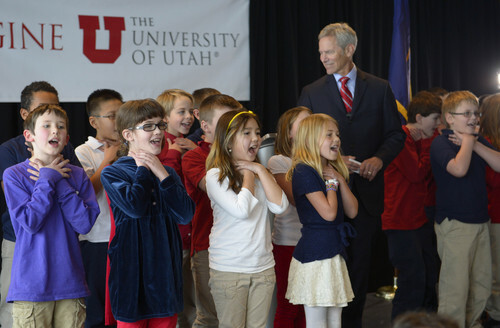 Rick Egan | The Salt Lake Tribune Salt Lake City Mayor Ralph Becker listens to fourth-graders from Whittier Elementary School sing a song about air pollution as part of his 2014 presentation of the State of the City Address in the Varsity Room on the 6th floor of the Rice-Eccles Stadium & Tower, Wednesday, January 8, 2014. Ralph Becker is low on ammo and calling for backup. Gov. Gary Herbert and the Utah Legislature will be derelict in their duties if they do not answer his distress call. The mayor of Salt Lake City did not use his annual State of the City address Wednesday to tick off a list of his own personal successes and goals. Instead, Becker devoted his speech to the single worst thing about his city: the disgraceful state of air quality in much of northern Utah. "Like so many of us, I love Salt Lake City," Becker said. "I wouldn&apos;t want to live anywhere else. But we&apos;re killing our own future." Not the normal political happy talk. But unquestionably true. The nasty composition of the air along the Wasatch Front, particularly this time of year, is a clear and present danger to our physical, emotional and economic health. It is the smog that will choke the golden goose. The second-term mayor did have some accomplishments to brag about on that score. They range from the opening of the new net-zero energy Public Safety Building to policies that encourage walkable developments, energy-efficient construction, transit use and bicycling. But that&apos;s not going to cut it. Not just because Salt Lake City is a small portion of the valley&apos;s airshed, but because the real weapons in the battle are not in the city&apos;s arsenal, but in the state&apos;s.
• Allocate more money for public transit. Getting cars off the road is the biggest single step toward cleaning up the air. • Raise the gasoline tax. Money spent on roads needs to come from that user fee, not be taken from transit, education and other needs. And motorists need to feel the cost of the dirty air they are creating in their wallet. • Change state law to allow stricter environmental standards than are imposed by the federal government. This is the only area in which the Utah Legislature defers to federal wisdom, and the worst. • Mandate the use of low-sulphur gasoline. Such fuel is already produced by at least one local refinery, only to be shipped to states where it is required. • Adopt the most recent version of national building codes, mandating much better energy efficiency standards. Becker has dared to tell the truth about what really matters. His agenda should set the Legislature&apos;s this year.